The approach described in the site is very good, being realistic about what can be achieved (variation is inevitable and perfect control is very difficult) but giving good guidance on anticipating changes in gluocse and trying to avert wider fluctuations. Information on the site is limited and mainly found in the blog link, as most of this is otherwise provided by the advertised workshops and book. The book is very good indeed and very practical. 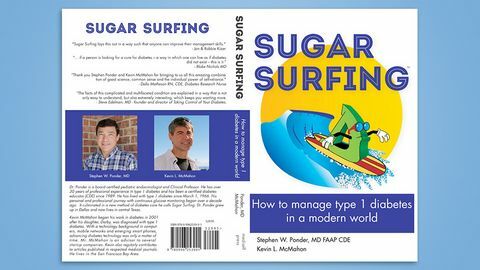 SugarSurfing is a concept of managing day to day glucose levels by a series of techniques used by the main author, Dr Stephen Ponder, who is a USA Paediatric Endocrinologist but more importantly has Type 1 Diabetes himself. Many different techniques, many used by advanced CGM users or insulin pump users, are pulled into one place and can show even beginners some great tips/tricks for managing glucose, using 'brakes', 'levers' and so on. Attending Dr Ponder's JDRF Discovery Day opened my eyes up to a different way of thinking and helped me realise that people without Type 1 don't have straight line CGM graphs so perhaps it was time for us to stop worrying so much.